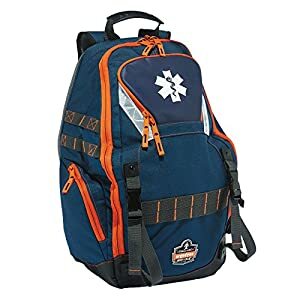 7 Best Medical Bag Reviews and Medical Kits - List in 2019! A good medical bag is a must-have if you’re an EMS responder or make house calls. You can also purchase one if you’re an agency nurse or just want a convenient container to keep your home medicine in order. In this article, I’ve chosen 7 most practical bags to meet different healthcare needs. A medical bag, also known as a little black bag, has been around since the ancient times. However, it hasn’t looked the way it looks now all the time. At the turn of the 20th century, a nursing bag has become an essential part of public and community health practice due to the scientific and social progress. A suitable bag not only enables to keep all the medical gear safe and clean. 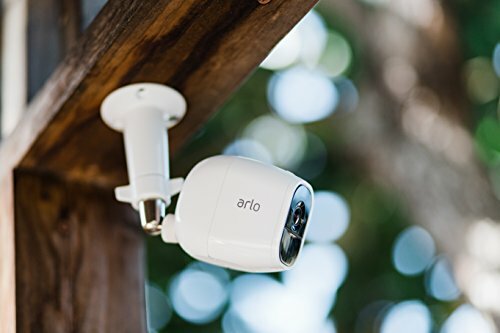 It is also easy to use and comfortable to carry. Also, keep in mind that, apart from the items mentioned above, you may also need other personal things. They can include a laptop, chargers, individual care products, a lunch box, etc. All of these items require space and an easy access. Therefore, here are 3 major features to consider while choosing your best medical bag. These are important characteristics because a wisely chosen bag both serves longer and saves your health. Think about it this way: if you travel around the city on foot, you would want a compact, lightweight, durable bag with a padded strap or a comfortable backpack not to overstrain your back and shoulders. If you’re driving a car or riding a bike, though, the size does not matter that much. Also, if you’re prone to carrying a laptop, you would want a separate padded compartment for it. If you’re taking liquids, bulky items and/or a lot of medicine with you, you would want to keep everything in place and organized. In this case, consider a bag or a backpack with separate compartments, holding straps and/or detachable pouches. Since your you’re going to use your bag frequently, choose the item made of sturdy long-lasting materials. Synthetic fabrics like Polyester or Nylon are strong and durable, and reinforced bottom will keep your bag from tearing, providing extra protection for your equipment. A medical bag can serve various purposes, so before purchasing one, you have to understand what exactly you will need it for. Suppose you’re a medical student or a nurse. You’ll need a comfortable, durable bag or a backpack for everyday use. There will be several compartments for clinical and personal items. 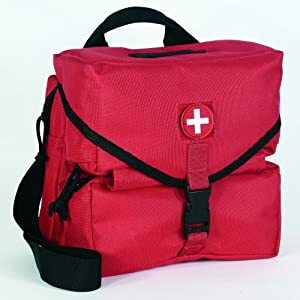 If you’re looking for a bag that can serve as a first-aid kit or an EMS\paramedic bag, again, please consider where and how you’ll be using it. A first-aid kit is usually smaller and contains only the most necessary things. They are generally set up for a particular event, but, of course, you can fill it with more general-purpose items. 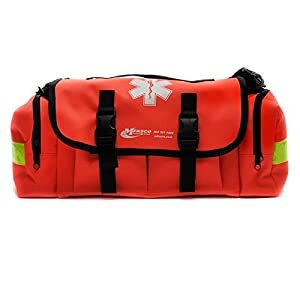 EMS bags are usually bigger, since the emergency gear is bulkier. These bags are often colored red and may have fluorescent or light-deflecting elements. With this being said, let’s take a look at the bags. American Diagnostic Corporation was established in 1984 and is one of the most prominent medical product manufacturers in the USA. It holds several ISO certifications and has a reputation of a reliable company producing top-quality medical equipment. This well-composed bag has plenty of pockets. They can fit anything you might need during the home visits or on your way to hospital. 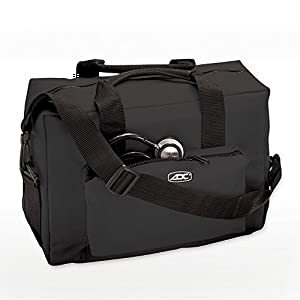 Although this bag may look somewhat hefty, it is just the right size to make room for most of the healthcare equipment one might need, including a stethoscope, an ophthalmoscope, a BP cuff, a thermometer, etc. The bag’s main compartment opens on the top and has a double zipper. There are two interior zippered pockets and 11 gusseted pockets of different sizes and shapes for any smaller supplies. The bag is also suitable for folders, clipboards, and even a tablet, but a laptop may be too much. The bag is made of Nylon and is well-padded inside. There’s an adjustable, removable shoulder strap and 2 side handles. This bag is perfect for medical students and can serve as a compact personal EMT bag. It does not feature separate clean/dirty compartments, though. So it may not be suitable for home-care nursing. Nurse Mates is a company that specializes in medical footwear, scrubs, and accessories, and is famous for a diverse range of styles. This nursing bag has been designed mainly to meet all needs a nurse might have. This bag has a shape that resembles a traditional medical bag with a hinged top, but with a few apparent differences. Firstly, there are 3 zippered front pockets, 2 flap pockets on the sides and 1 folder pocket on the back. The main pocket is roomy and features two compartments. One can serve as a handy section, which is practical if you’re making home calls. The biggest front pocket opens up widely and is suitable for smaller items and supplies. This bag is made of Nylon and features a non-skid padded bottom, an adjustable and removable strap and the handles with a Velcro holder. The heavy-duty material is water- and stain-resistant, which altogether makes this bag quite long-lasting. This bag has been created specifically for nurses. But it will also suit for medical students since the bag allows books, laptop and a lunch box not stealing space from the clinical equipment. Watch the video from a medical student to see how spacious the bag is! For more than 60 years, Rothco has been known for its quality military gear and associated products. The EMT bags, just like any other Rothco supplies, have proven themselves to be robust, durable and practical. This is a rather large bag, compared to the previous two. It has 7 outer pockets (2 flap pockets and 5 zippered pockets) of various sizes to fit all the necessary supplies and equipment a healthcare professional might need. In the main compartment, there is a removable divider, which will help to keep all the contents in place and organized. The bag is made of Polyester, it is rugged, waterproof and wear-resistant. There are 2 D-rings in front and six-loop bandolier behind for additional gear. The shoulder strap can be removed or adjusted, and the carry handles feature a Velcro holder – amazing features to improve your experience. This bag is supposed to be used by paramedics and first responders. Medical experts working at the public events can use it as well. Voodoo Tactical is a company that specializes in tactical gear, outwear, footwear and relatable items, with a particular focus on Modular Lightweight Load-Carrying Equipment (MOLLE) that can be attached to the Pouch Attachment Ladder System (PALS). 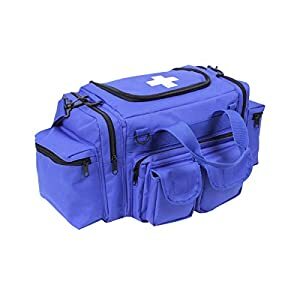 This universal medic bag falls right into that category. It is a medium-sized kit with 3 fold-out pouches that are snuggly tucked under a top lid when folded. There’s also an extra vertical slip-pocket allowing a quick and easy access. The bag is made of the durable Nylon (stitched and designed to last). Although there is no padding inside, be careful while using fragile supplies. Due to its moderate size and handy contents, this bag can be used as a travel, hunting or combat first-aid kit or a car safety bag. It can also come in handy if you’re about to go hiking in the mountains or elsewhere in the wild. Watch this video review if you’d like to have a closer look at this bag. Please note that it does not contain any supplies shown in the video! This Arsenal Responder Backpack by Ergodyne has been designed to meet the requirements of the emergency healthcare professionals who often work in hazardous settings and where time is the enemy. 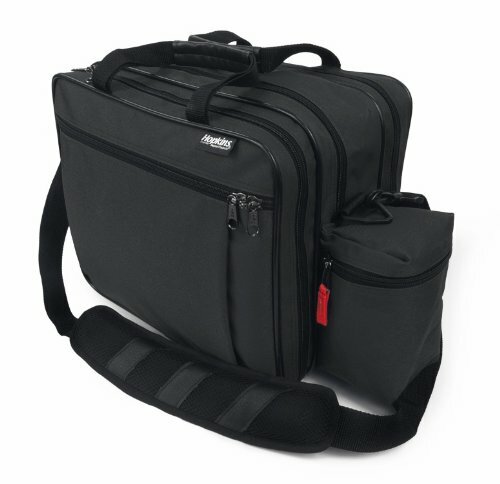 The construction of this EMS bag allows quick access and is easy to carry and maintain. The backpack is big enough to fit the equipment like AED, CPR-masks, BP cuffs and other first-aid supplies. On the outside, there are 2 side pockets, PALS webbing, reflective elements and 2 adjustable straps to hold the blanket or any other additional bulky items. The drop-down front features a double lock-ready zipper to secure the contents of your backpack. There’s also a smaller U-shaped zippered pocket. Inside there is one large compartment with two mesh pockets with ID windows. The front part on the inside features a PALS webbing for tools and a large transparent pocket. This medical backpack is made of heavy-duty 600D Polyester. The bottom is reinforced with Tarpaulin and features molded feet. This backpack has been designed for the first responder needs where time can be crucial. But this bag works well for the less risky settings, too. It is spacious and can be used by the healthcare specialists who travel a lot. It can also meet the needs of the medical students, travelers and anybody who wants to keep their belongings in order while going somewhere. The shoulder straps and the back are decently padded, providing pressure relief to the back and shoulders. It is essential when you have to cover long distances or get to the remote areas. Watch this Arsenal first responder bags review to find out more about the product. MFSCO is one of the most prominent healthcare service providers in the US. Unlike other kits in this review, this MFSCO bag comes fully packed. The company also provides full or customized refill when the supplies are running short. Even though this kit may look small, it can, however, fit most of the necessary supplies. It has two zippered side pockets and two front pockets (closed with a top lid’s Velcro closures and buckle straps!) There is one compartment inside. The bag is made of Nylon and is designed to last. It is colored bright red and features reflective strips. There’s also a grab handle in the top and the adjustable, removable shoulder strap. Since the 1940s, Hopkins Medical Products have been providing healthcare professionals with medical supplies and equipment. This EZ-View Med Bag meets a wide range of needs of medical professionals. The bag consists of 3 sections. The back and front sections lay flat when open. There are plenty of separate pockets to store all the necessary items and 12 see-through folders (6 from each side) to store records, papers, dressings or any other clinical supplies, allowing to keep everything clean and well-organized. On the outside of each section, there is also a pocket. To be specific, there’s a zippered wide flat pocket on one side, and a simple slip-in pocket on the other. The central part is big enough to carry diagnostic equipment like a stethoscope or a BP unit as well as similar larger items. It can also fit in a tablet or a small laptop but does not contain any padding inside. There are 2 zippered side pockets, and one of them is spacious enough to provide a sharps container (indicated with a red zipper band). The bag is made of a sturdy Rip-Stop material that will serve you for a long time. The bag features a removable and adjustable padded shoulder strap and 2 carry handles. This bag should be the most convenient for home call nurses and physicians, and medical students, since it has a lot of compartments to store every item a medical professional might ever need. Choosing a medical bag may be sometimes quite challenging. Well, but it is so handy! What is more, you will look professional, boosting your status of the medical expert. In case you have been working in the healthcare field for a long time, you may want an upgrade and select a more convenient and modern bag model. Needless to say, your bag should be comfortable, practical, and durable. It has to comply with your personal and professional needs. So consider all the above-mentioned criteria when picking the item for everyday use at work. Hope that you found this article useful and managed to make your choice. Now I will be glad to hear from you! Please share your opinion in the comments below! 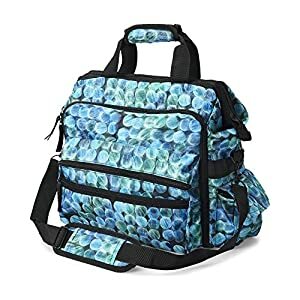 Feel free to discuss both pros and cons these items have and help other medical experts select a really convenient bag.